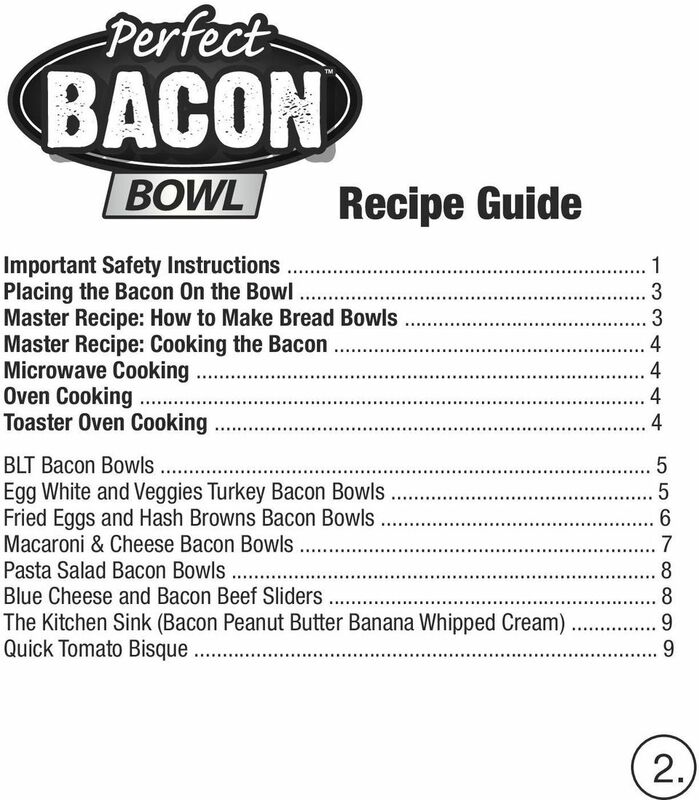 Download "2013 APG Distributed by Allstar Products Group, Hawthorne, NY Perfect Bacon is a trademark of APG Patent Pending"
2 IMPORTANT SAFETY INSTRUCTIONS DO NOT use the Perfect Bacon Bowl before reading all instructions and warnings. Keep this instruction sheet for future reference. 1. The Perfect Bacon Bowl is top-rack dishwasher-safe. 2. When hand washing, always wash the Perfect Bacon Bowl with warm soapy water and a soft, non-abrasive sponge to assure clean, safe cooking. 3. When using the Perfect Bacon Bowl, handle all hot surfaces with pot holders or cooking mitts. 4. Handling hot surfaces with wet pot holders or cooking mitts can produce steam causing serious burns to the skin. 5. When handling the Perfect Bacon Bowl, take all necessary precautions to avoid burns, cuts or serious personal injury. 6. 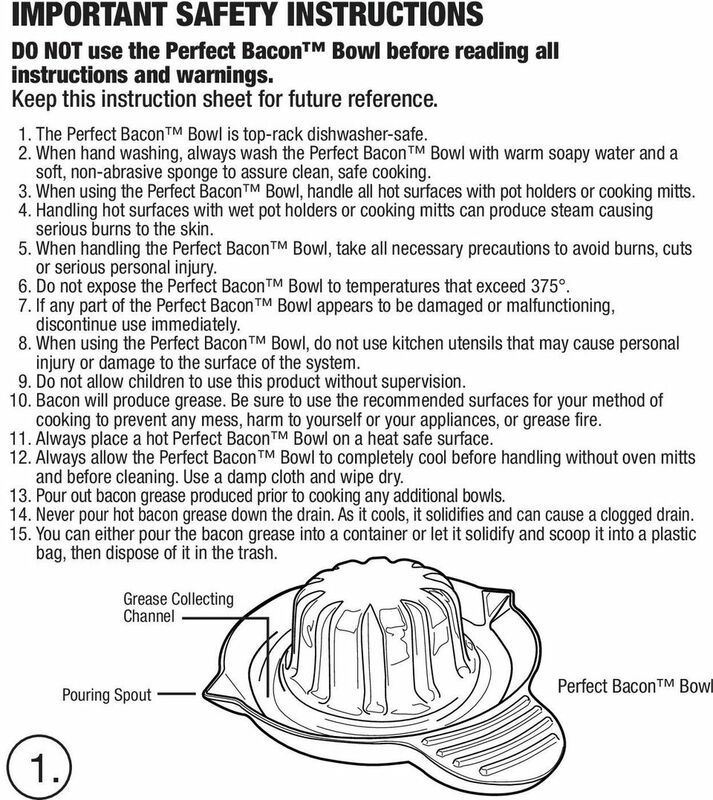 Do not expose the Perfect Bacon Bowl to temperatures that exceed If any part of the Perfect Bacon Bowl appears to be damaged or malfunctioning, discontinue use immediately. 8. When using the Perfect Bacon Bowl, do not use kitchen utensils that may cause personal injury or damage to the surface of the system. 9. Do not allow children to use this product without supervision. 10. Bacon will produce grease. Be sure to use the recommended surfaces for your method of cooking to prevent any mess, harm to yourself or your appliances, or grease fire. 11. Always place a hot Perfect Bacon Bowl on a heat safe surface. 12. Always allow the Perfect Bacon Bowl to completely cool before handling without oven mitts and before cleaning. Use a damp cloth and wipe dry. 13. Pour out bacon grease produced prior to cooking any additional bowls. 14. Never pour hot bacon grease down the drain. As it cools, it solidifies and can cause a clogged drain. 15. You can either pour the bacon grease into a container or let it solidify and scoop it into a plastic bag, then dispose of it in the trash. Grease Collecting Channel Pouring Spout Perfect Bacon Bowl 1. 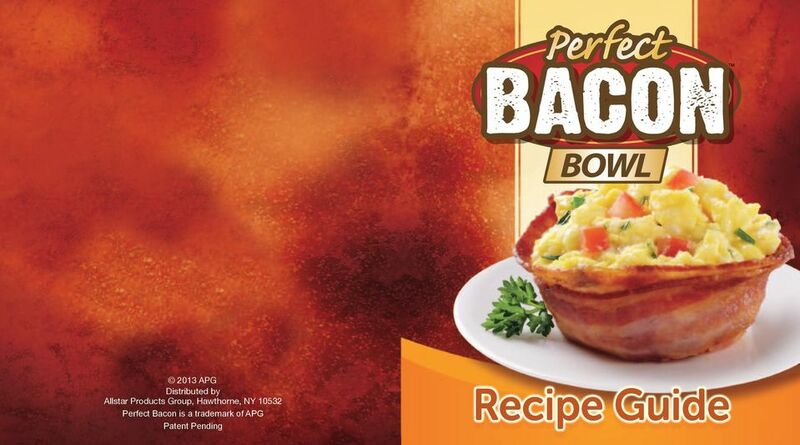 4 PLACING THE BACON ON THE PERFECT BACON BOWL Perfect Bacon Bowl can be used in the microwave, toaster oven, or oven. 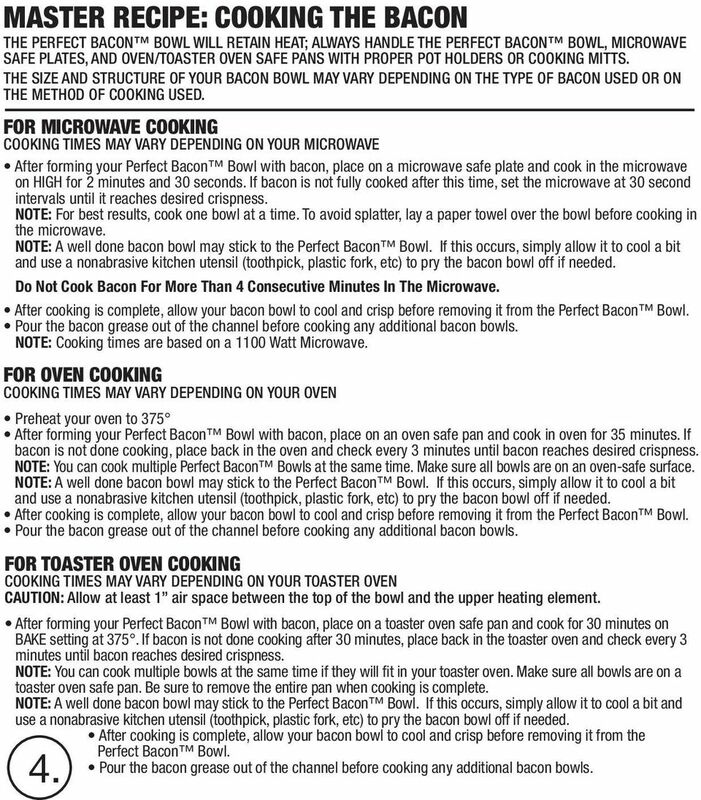 Please follow the instructions below on how to place the bacon on the Perfect Bacon Bowl, then for the method of cooking you will use. Start by using three strips of your favorite bacon (diagram A). NOTE: It is not recommended to use center cut bacon. Step 1: You MUST begin by applying non-stick cooking spray or cooking oil onto a paper towel to evenly coat the surface of the Perfect Bacon Bowl before each use. DO NOT spray or pour oil directly onto the Perfect Bacon Bowl (diagram B). 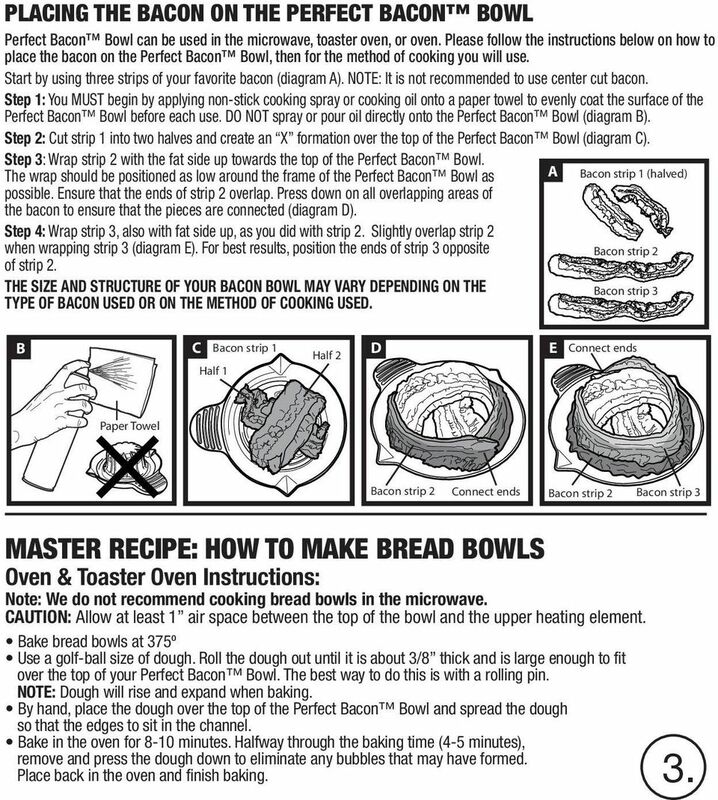 Step 2: Cut strip 1 into two halves and create an X formation over the top of the Perfect Bacon Bowl (diagram C). Step 3: Wrap strip 2 with the fat side up towards the top of the Perfect Bacon Bowl. The wrap should be positioned as low around the frame of the Perfect Bacon Bowl as possible. Ensure that the ends of strip 2 overlap. Press down on all overlapping areas of the bacon to ensure that the pieces are connected (diagram D). Step 4: Wrap strip 3, also with fat side up, as you did with strip 2. Slightly overlap strip 2 when wrapping strip 3 (diagram E). For best results, position the ends of strip 3 opposite of strip 2. THE SIZE AND STRUCTURE OF YOUR BACON BOWL MAY VARY DEPENDING ON THE TYPE OF BACON USED OR ON THE METHOD OF COOKING USED. A Bacon strip 1 (halved) Bacon strip 2 Bacon strip 3 B C Bacon strip 1 Half 1 Half 2 D E Connect ends Paper Towel Bacon strip 2 Connect ends Bacon strip 2 Bacon strip 3 MASTER RECIPE: HOW TO MAKE BREAD BOWLS Oven & Toaster Oven Instructions: Note: We do not recommend cooking bread bowls in the microwave. CAUTION: Allow at least 1 air space between the top of the bowl and the upper heating element. Bake bread bowls at 375º Use a golf-ball size of dough. Roll the dough out until it is about 3/8 thick and is large enough to fit over the top of your Perfect Bacon Bowl. The best way to do this is with a rolling pin. NOTE: Dough will rise and expand when baking. By hand, place the dough over the top of the Perfect Bacon Bowl and spread the dough so that the edges to sit in the channel. Bake in the oven for 8-10 minutes. Halfway through the baking time (4-5 minutes), remove and press the dough down to eliminate any bubbles that may have formed. Place back in the oven and finish baking. 3. 5 MASTER RECIPE: COOKING THE BACON THE PERFECT BACON BOWL WILL RETAIN HEAT; ALWAYS HANDLE THE PERFECT BACON BOWL, MICROWAVE SAFE PLATES, AND OVEN/TOASTER OVEN SAFE PANS WITH PROPER POT HOLDERS OR COOKING MITTS. THE SIZE AND STRUCTURE OF YOUR BACON BOWL MAY VARY DEPENDING ON THE TYPE OF BACON USED OR ON THE METHOD OF COOKING USED. FOR MICROWAVE COOKING COOKING TIMES MAY VARY DEPENDING ON YOUR MICROWAVE After forming your Perfect Bacon Bowl with bacon, place on a microwave safe plate and cook in the microwave on HIGH for 2 minutes and 30 seconds. If bacon is not fully cooked after this time, set the microwave at 30 second intervals until it reaches desired crispness. NOTE: For best results, cook one bowl at a time. To avoid splatter, lay a paper towel over the bowl before cooking in the microwave. NOTE: A well done bacon bowl may stick to the Perfect Bacon Bowl. If this occurs, simply allow it to cool a bit and use a nonabrasive kitchen utensil (toothpick, plastic fork, etc) to pry the bacon bowl off if needed. Do Not Cook Bacon For More Than 4 Consecutive Minutes In The Microwave. After cooking is complete, allow your bacon bowl to cool and crisp before removing it from the Perfect Bacon Bowl. Pour the bacon grease out of the channel before cooking any additional bacon bowls. NOTE: Cooking times are based on a 1100 Watt Microwave. FOR OVEN COOKING COOKING TIMES MAY VARY DEPENDING ON YOUR OVEN Preheat your oven to 375 After forming your Perfect Bacon Bowl with bacon, place on an oven safe pan and cook in oven for 35 minutes. If bacon is not done cooking, place back in the oven and check every 3 minutes until bacon reaches desired crispness. NOTE: You can cook multiple Perfect Bacon Bowls at the same time. Make sure all bowls are on an oven-safe surface. NOTE: A well done bacon bowl may stick to the Perfect Bacon Bowl. If this occurs, simply allow it to cool a bit and use a nonabrasive kitchen utensil (toothpick, plastic fork, etc) to pry the bacon bowl off if needed. After cooking is complete, allow your bacon bowl to cool and crisp before removing it from the Perfect Bacon Bowl. Pour the bacon grease out of the channel before cooking any additional bacon bowls. FOR TOASTER OVEN COOKING COOKING TIMES MAY VARY DEPENDING ON YOUR TOASTER OVEN CAUTION: Allow at least 1 air space between the top of the bowl and the upper heating element. After forming your Perfect Bacon Bowl with bacon, place on a toaster oven safe pan and cook for 30 minutes on BAKE setting at 375. If bacon is not done cooking after 30 minutes, place back in the toaster oven and check every 3 minutes until bacon reaches desired crispness. NOTE: You can cook multiple bowls at the same time if they will fit in your toaster oven. Make sure all bowls are on a toaster oven safe pan. Be sure to remove the entire pan when cooking is complete. NOTE: A well done bacon bowl may stick to the Perfect Bacon Bowl. If this occurs, simply allow it to cool a bit and use a nonabrasive kitchen utensil (toothpick, plastic fork, etc) to pry the bacon bowl off if needed. After cooking is complete, allow your bacon bowl to cool and crisp before removing it from the Perfect Bacon Bowl. Pour the bacon grease out of the channel before cooking any additional bacon bowls. 4. 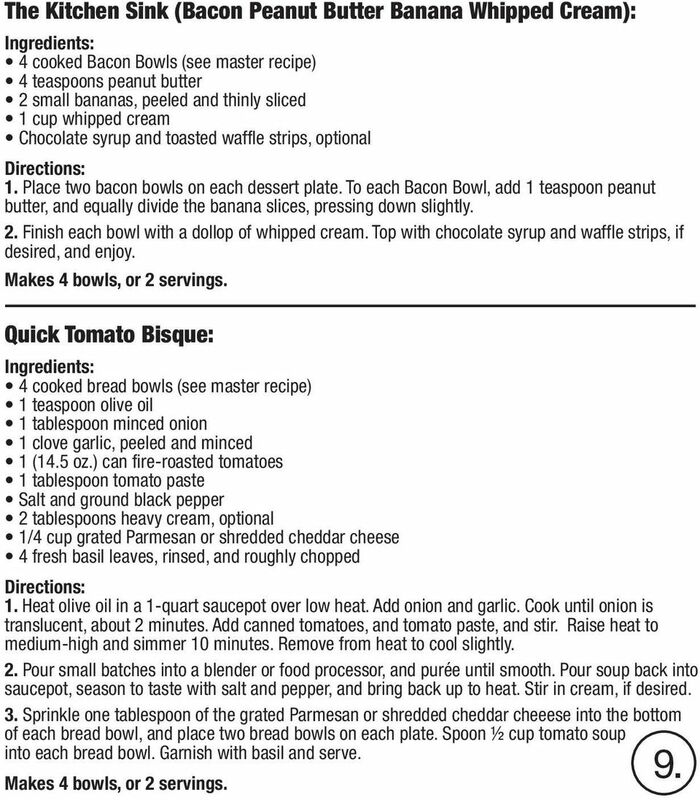 6 BLT Bacon Bowls: 2 cooked bacon bowls (see master recipe) 1/2 cup shredded iceberg or romaine lettuce, chilled 2 teaspoons Mayonnaise 4 thin slices plum tomato Salt and ground black pepper, to taste 1. Divide shredded lettuce between both Bacon Bowls. 2. Spoon 1 teaspoon mayonnaise, then two tomato slices into each bowl. Sprinkle with salt and pepper to taste, and serve. Makes 2 bacon bowls, or one serving. Egg Whites and Veggies Turkey Bacon Bowls: 4 cooked turkey Bacon Bowls (see master recipe) 2 teaspoons butter 1/4 cup red onions, finely chopped 1/4 cup bell pepper, seeds and membrane removed, finely chopped 1 teaspoon chopped fresh parsley, or 1/2 teaspoon dried, optional 4 egg whites or egg substitute, lightly beaten Ground black pepper, to taste 1. Melt 1 teaspoon butter in medium non-stick skillet over medium heat. Add onions and bell pepper. Cook, stirring occasionally, until onions are tender and start to brown, about 5 minutes. 2. Melt remaining butter. Add eggs and cook, stirring, until eggs whites are set, about 4 minutes. Season to taste with pepper. Remove from heat. 3. 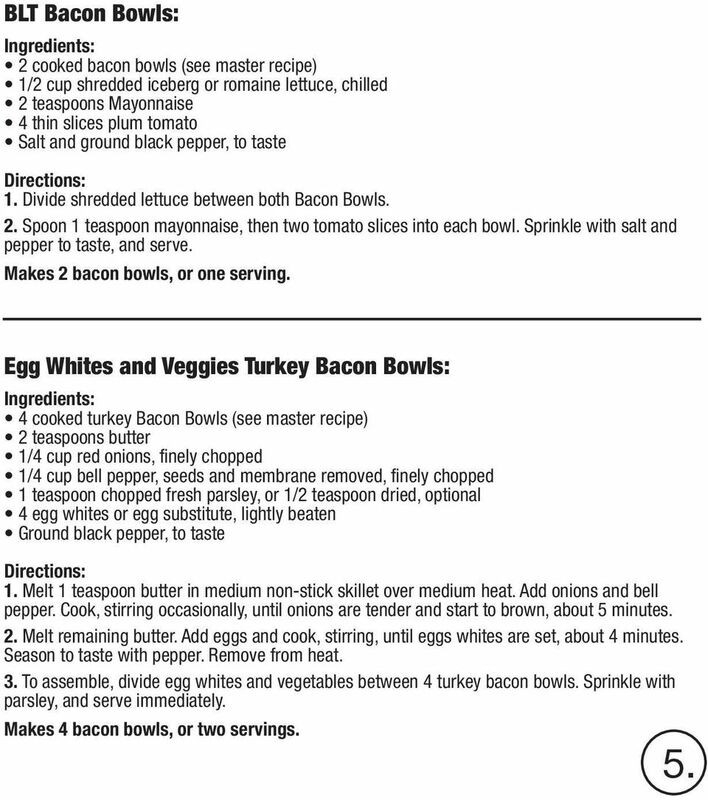 To assemble, divide egg whites and vegetables between 4 turkey bacon bowls. Sprinkle with parsley, and serve immediately. Makes 4 bacon bowls, or two servings. 5. 7 Fried Eggs and Hash Browns Bacon Bowls: 4 cooked Bacon Bowls (see master recipe) For Hash Browns: 1 russet potato, peeled 1 tablespoon butter 1 tablespoon vegetable oil Salt and ground black pepper, to taste 1 pinch cayenne pepper, to taste For Eggs: 1 tablespoon butter 4 eggs Salt and ground black pepper, to taste Make the hash browns: 1. Shred potatoes into a large bowl filled with cold water. Stir, drain, and cover potatoes again with water. Stir once more, and drain potatoes well. Pat dry with paper towels, and squeeze out excess moisture. 2. Melt butter and oil in a large non-stick pan over medium heat. Sprinkle shredded potatoes into the pan and season with salt, black pepper, and cayenne pepper. 3. Cook potatoes until a brown crust forms on the bottom, about 5 minutes. Continue to cook and stir until potatoes are browned all over, about 5 more minutes. Keep warm in skillet or on a plate in the oven. Make the eggs: 4. Heat the remaining butter in medium non-stick skillet over medium heat. When butter is melted and stops bubbling, add eggs and cook until whites and yolks are set, about 4 minutes, or until desired doneness. Season with salt and pepper to taste. Remove from heat. 5. To assemble, divide hash browns between all four bacon bowls, and top each with an egg. Serve immediately. Makes 4 bacon bowls, or two servings. 6. 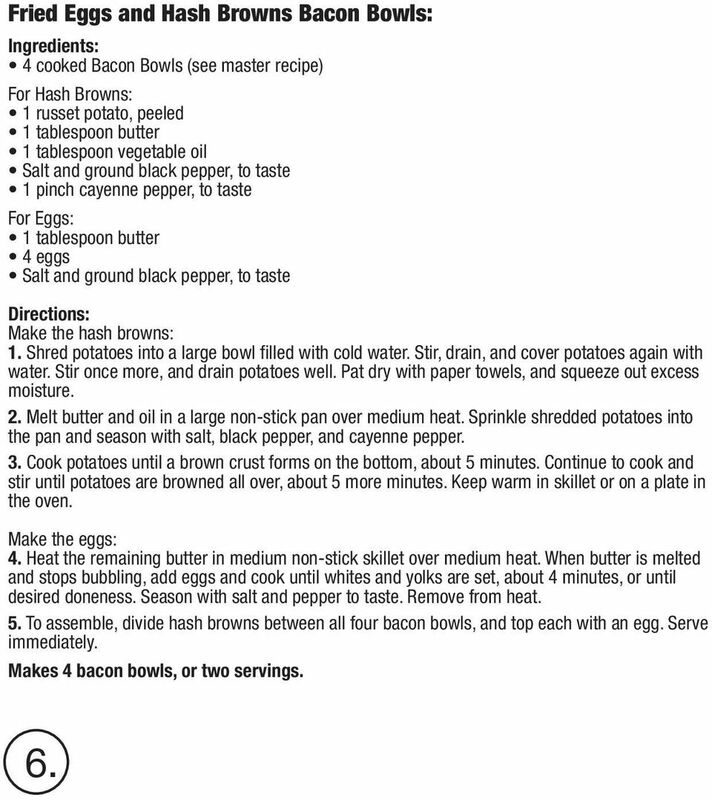 8 Macaroni & Cheese Bacon Bowls: 4 cooked Bacon Bowls (see master recipe) 2 tablespoons butter, plus extra for greasing baking dish 2 tablespoons flour 1 cup milk 1/4 tsp. dry mustard 1 1/2 cups shredded sharp Cheddar cheese 1/4 cup grated Parmesan cheese 2 cups cooked elbow macaroni 1. Preheat oven to 375ºF. Butter the inside of a 1-quart baking dish, and set aside. 2. Melt butter in saucepan on low heat. Blend in flour. Cook, stirring constantly, 1 minute. Gradually add milk; cook, stirring constantly, until thickened. 3. Combine cheeses, and mustard. Add 1 cup cheese mixture to sauce; stirring until melted. 4. Mix cooked macaroni into cheese sauce. Spoon into greased baking dish. Top with remaining cheese. 5. Bake at 375ºF minutes, or until hot. Let stand 5 minutes. Spoon 1/2 cup into each Bacon Bowl, and serve. Makes 4 bacon bowls, or two servings. 7. 9 Pasta Salad Bacon Bowls: 4 cooked Bacon Bowls (see master recipe) 2 cups cooked orzo pasta 1 tablespoon olive oil 1/2 tsp. dry oregano 2 tablespoons sundried tomatoes, finely chopped 2 tablespoons pitted black olives, thinly sliced 2 tablespoons grated Parmesan, or crumbled feta cheese Ground black pepper 1. Warm Bacon Bowls in the oven at 200ºF, if desired. 2. Combine all other ingredients in a medium bowl and gently toss together. Season to taste with pepper. 3. Spoon 1/2 cup pasta salad in to each Bacon Bowl. Serve. Makes 4 bacon bowls, or two servings. 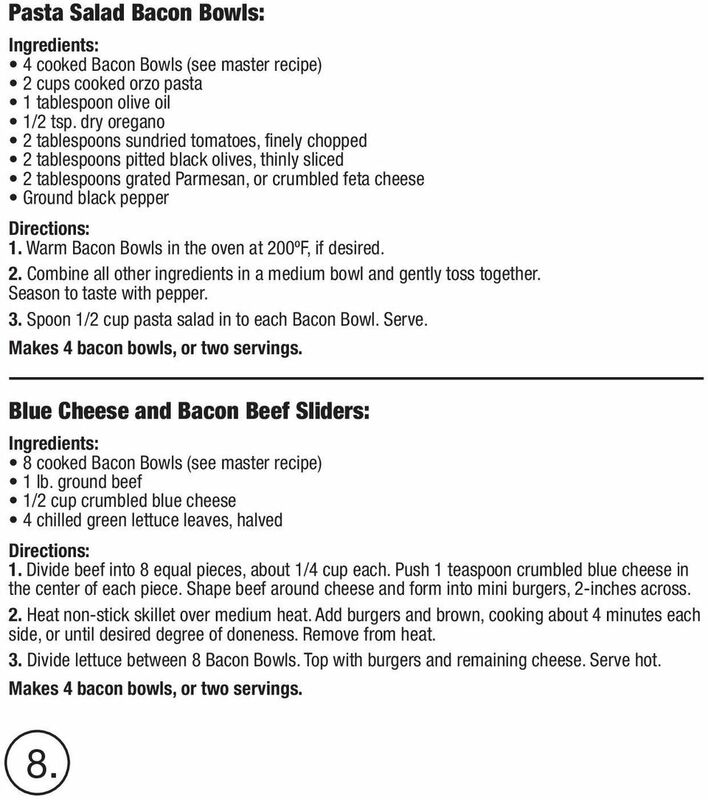 Blue Cheese and Bacon Beef Sliders: 8 cooked Bacon Bowls (see master recipe) 1 lb. ground beef 1/2 cup crumbled blue cheese 4 chilled green lettuce leaves, halved 1. Divide beef into 8 equal pieces, about 1/4 cup each. Push 1 teaspoon crumbled blue cheese in the center of each piece. Shape beef around cheese and form into mini burgers, 2-inches across. 2. Heat non-stick skillet over medium heat. Add burgers and brown, cooking about 4 minutes each side, or until desired degree of doneness. Remove from heat. 3. Divide lettuce between 8 Bacon Bowls. Top with burgers and remaining cheese. Serve hot. Makes 4 bacon bowls, or two servings. 8. 10 The Kitchen Sink (Bacon Peanut Butter Banana Whipped Cream): 4 cooked Bacon Bowls (see master recipe) 4 teaspoons peanut butter 2 small bananas, peeled and thinly sliced 1 cup whipped cream Chocolate syrup and toasted waffle strips, optional 1. Place two bacon bowls on each dessert plate. To each Bacon Bowl, add 1 teaspoon peanut butter, and equally divide the banana slices, pressing down slightly. 2. Finish each bowl with a dollop of whipped cream. Top with chocolate syrup and waffle strips, if desired, and enjoy. Makes 4 bowls, or 2 servings. Quick Tomato Bisque: 4 cooked bread bowls (see master recipe) 1 teaspoon olive oil 1 tablespoon minced onion 1 clove garlic, peeled and minced 1 (14.5 oz.) can fire-roasted tomatoes 1 tablespoon tomato paste Salt and ground black pepper 2 tablespoons heavy cream, optional 1/4 cup grated Parmesan or shredded cheddar cheese 4 fresh basil leaves, rinsed, and roughly chopped 1. Heat olive oil in a 1-quart saucepot over low heat. Add onion and garlic. Cook until onion is translucent, about 2 minutes. Add canned tomatoes, and tomato paste, and stir. Raise heat to medium-high and simmer 10 minutes. Remove from heat to cool slightly. 2. Pour small batches into a blender or food processor, and purée until smooth. Pour soup back into saucepot, season to taste with salt and pepper, and bring back up to heat. Stir in cream, if desired. 3. Sprinkle one tablespoon of the grated Parmesan or shredded cheddar cheeese into the bottom of each bread bowl, and place two bread bowls on each plate. Spoon ½ cup tomato soup into each bread bowl. Garnish with basil and serve. 9. Makes 4 bowls, or 2 servings. Name: Hour: Review: 1. What are the similarities and differences between a blender and a hand blender? #300030 Name: Hour: VIDEO WORKSHEET Review: After viewing Small Kitchen Appliances, answer the following questions. 1. What are the similarities and differences between a blender and a hand blender? 2. Use ingredients that are readily available so preparing food is both time and cost effective. Supervisors Discussion Guide for Food Safety Presentation This guide is meant to help staff process what they learn in this presentation and answer any questions that may come up during the presentation. With its distinctive and exclusive nutty taste, pumpkin seed oil can be used a substitute for pretty much any other vegetable oil.